NIOZ T-sensors were initially calibrated in-situ near the mooring against a shipborne SeaBird 911 CTD, by holding them in near-homogeneous ocean layers (cf. visible in the Canary Basin videos 1,2 on the main page of the temperature sensors). 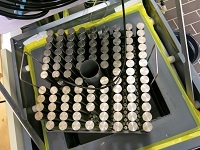 While in situ CTD data are still needed to establish the temperature – density relationship, NIOZ T-sensors are nowadays calibrated in a laboratory tank. On the images Martin Laan is seen to load the laboratory bath for the calibration of high-resolution temperature sensors. About 205 sensors are put head-down in a 0.03 m thick titanium plate for fast and smooth heat conduction. The temperature of the plate can be held constant to within 0.1 mK, tested in the range between -5 and +35°C. For reference up to three platinum SeaBird SBE35 Deep Ocean Standard Thermometers can be inserted into the bath.